Randy Moss’ agent informed us all today he has decided to retire. A month later from hearing he’s in the best shape in his life, he decided to hang the cleats up after 13 years of play. I wasn’t sure if a team was going to give him a chance this season. Braylon Edwards, Steve Smith, and Malcolm Floyd are still on the market and they’re all better WR’s than Moss at this point in his career. Some people think Moss will pull a Brett Favre, but I think he’ll actually stay retired. Moss’ past year was really rough. He reached lows in receptions, yards, and only started 11 games. The last time that happened he was a rookie. He bounced around to three teams. He was traded to the Vikings from New England, and then picked up by the Tennessee Titans off waivers after being released by Minnesota. The past season is not how I’m going to remember him at all. 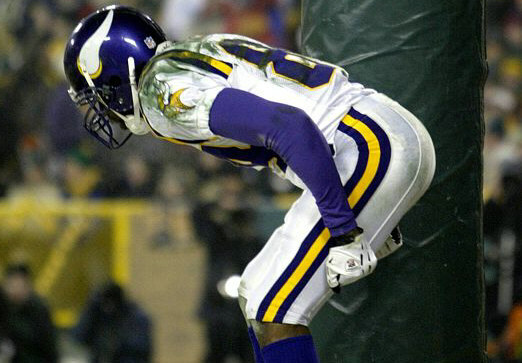 In my eyes Randy Moss is a legend, a true first ballot Hall of Famer. I’m sure you all think that too. It’s also a shame Jerry Jones passed on this guy. He made Jerry remember it every time he played the Cowboys. His Thanksgiving performance in Dallas is one of his greatest. I’m too young to remember Moss as a dominant Viking. I do remember his last couple seasons with the team, but I mostly remember him as a Raider/Patriot. Which isn’t that bad considering he did have a great run in New England. He was such an impact player. Randy was voted to 7 pro-bowls and a 5 time all pro. He’s scored 153 touchdowns, 14858 yards, and 954 receptions. He’s had 5 seasons with at least 15 touchdowns, a hard feat for a WR. He was so hard to cover. So tall and a freakish athlete. Moss was fast enough to beat the corner down the field. He was the perfect deep threat. The team he should be most associated with is the Minnesota Vikings. He and Dante Culpepper were a great match. During his first stint with the Vikings he racked up over 9316 yards, 587 receptions, and 92 touchdowns. He owns the record for most touchdowns as a rookie WR with 17. He also led the league in touchdowns that year, and 4 other years as a pro. He ran into injury troubles in his last season in Minnesota. So he was traded to the Oakland Raiders. He was never the same player in Oakland. Moss continued to suffer from injuries and had no interest in playing for a bad team. Coming into the 2007 season, Moss was rumored to be traded by the Raiders. The two most interested teams were the Patriots and Packers. Favre even said “There is no person in this league who puts more fear into people than Moss.” The Packers would have to keep fearing because Moss was traded to the Patriots. Brady and Moss linking up turned out to be the perfect match. The Patriots went 16-0 and the QB-WR duo both league wide records for touchdowns thrown and caught in a season. Moss caught 23 of Brady’s 50 touchdown passes that season. Moss even had a big go aheadTD grab in SB XLII with 2:42 left. In the end it wouldn’t matter because the Patriots ended up losing the game. The next two years in NE were also good, but he left the Pats after talking his way out. He was traded back to Minnesota, but left New England having 50 touchdowns, close to 4,000 yards, and 259 receptions. Which brings me to where does Moss rank all time as a wide receiver? Jerry Rice is clearly the greatest ever. But Moss has great career numbers. He’s top 10 in the following categories, touchdowns, receiving yards, receiving yards per game, receptions, and longest reception. So who are the top 5 WR’s of all time? If Moss decides to stay retired he should be inducted into the Pro Football Hall of Fame with Brett Favre.